Kenneth MacMillan's dramatic ballet is inspired by the story of Anna Anderson, who believed herself to be the famous Russian princess. The Royal Ballet’s revival of Kenneth MacMillan's Anastasia, will be broadcast live to cinemas around the world at 7.15pm GMT on 2 November 2016. Download the Anastasia Digital Programme for free using the promo code FREEANA and enjoy a range of specially selected films, articles, pictures and features to bring you closer to the production. The cinema relay will be presented by former Principal of The Royal Ballet Darcey Bussell and broadcaster Gethin Jones. MacMillan's ballet was inspired by the story of Anna Anderson, a woman who believed herself to be the Grand Duchess Anastasia, the youngest daughter of Tsar Nicholas II. During the time MacMillan created the ballet, rumours swirled that the princess may have survived the massacre that killed her family in 1918; but this was later disproved by DNA evidence. Some believed Anderson, but many did not, and the ballet shows her haunted by memories of a past that may not be hers. Acts I and II show the young Anastasia growing up, amid the final days of the Russian Empire – but in Act III, we encounter the conflicted Anna Anderson as she battles with her possibly imagined Imperial past. MacMillan originally created Act III of Anastasia as a one-act ballet for Deutsche Oper Ballet in 1967, and expanded it into a three-act work for The Royal Ballet in 1971. The ballet remains one of MacMillan's stylistically adventurous works. A new production, designed by Bob Crowley, was created in 1996, and it returns in 2016 for its second revival. Like MacMillan's choreography, Anastasia also features a prominent musical contrast. Pyotr Il’yich Tchaikovsky’s First and Third Symphonies are used for Acts I and II, while Czech composer Martinů’s Sixth Symphony is the score for Act III. 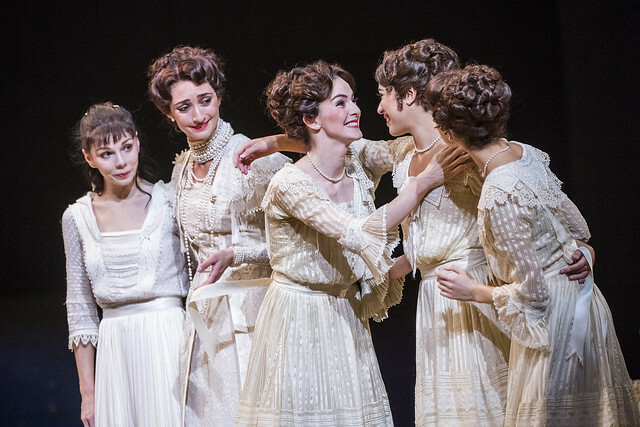 The cinema relay of Anastasia features many Principal Dancers of The Royal Ballet including Marianela Nuñez, Federico Bonelli, Edward Watson and Thiago Soares. Natalia Osipova will perform the lead role of Anastasia/Anna Anderson. After the relay on 2 November 2016, we will publish a roundup of the audience tweets, so share your thoughts using the hashtag #ROHanastasia. Anastasia will be broadcast live to cinemas around the world on 2 November 2016. Find your nearest cinema and sign up to our mailing list. The production is staged with generous philanthropic support from Hans and Julia Rausing, Sarah and Lloyd Dorfman, Richard and Delia Baker, The Tsukanov Family Foundation, Simon and Virginia Robertson and The Fonteyn Circle. First act lovely really taking us back in history. Wonderful staging. First class dancing a joy to be watching in Littlehampton. I want to see the replay after seeing the first relay. I note that three cinemas in the Portsmouth/Fareham are indicated on your map as running it on Sunday but only one (Gunwarf), actually has it on their own listings. This would be disappointing for some people. Thank you for brining this to our attention. We will follow up directly with the cinemas to ensure all future listings are advertised correctly. I am so sad that no theaters near me were playing this! I am in the USA and no local theaters get these amazing events. Is there any chance it will be released digitally or on DVD for purchase like other ROH performances? Thank you for your comment and your interest. We continue to get new cinemas showing ROH productions and there might be new ones in the USA, hopefully near you, soon. Please keep an eye on our webpage for future bookings: http://www.roh.org.uk/cinemas. And I'm very pleased to tell you that a DVD of the current Anastasia production will be released in Autumn 2017. To this date, no theatre in Ottawa Ontario Canada has carried the Anastasia relay. I am trying to reach the General Manager of Landmarks 24 in Kanata , the theatre which has carried all others, to see if there is a plan to show Anastasia. I am devastated! Re my complaint that the cinema nearest me in Kanata has NOT shown Anastasia....i wanted to also say that in the past, opera and ballet productions are shown on a Sunday ....always a Sunday...soon after your world wide release date. Also, i am now worried that the upcoming Nutcracker might not come to my cinema. Thank you for your comment. Bytowne Cinema in Ottawa will be showing The Nutcracker on 21st January. Hopefully that's not too far from you. Your nearest cinema for Anastasia might be Cinema 7 Valleyfield in Salaberry-de-Valleyfield. They have two screenings in December. Your comments will be passed on to our International partners and we get regular updates on new cinemas showing our content, so please keep an eye on our website for future ROH screenings. Wow, another MacMillan masterpiece with the talent and quality of artistry to transport one's soul. Great story and concept, use of music of 2+ composers, choreography, casting, production design and costumes. Congratulations to the great dance actress Natalia Osipova, amazing Marianela Nunez and Thiago Soares as Rasputin. Thank you! No DVD/Blu-Ray release has yet been confirmed, but should one be announced, these pages will share any information available. Hello! I would like to know if Anastasia is coming Cinema Live no Guadalajara, Mexico and when it will be released? I would love to see it. Many thanks for your interest. Anastasia was not booked by any cinema in Guadalajara. You can see what's being released in your area for the rest of this season here. The new season bookings will also appear on our webpage as soon as we get them.